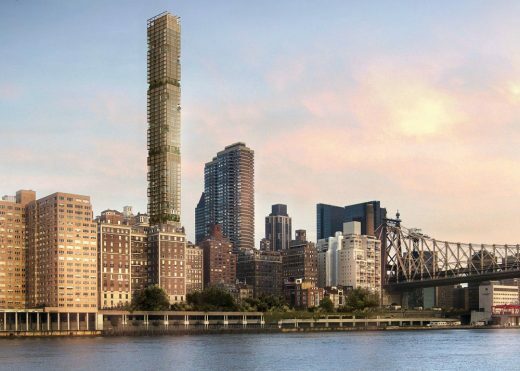 A new 30-story tower at the crossroads of Greenwich Village, SoHo and TriBeCa. 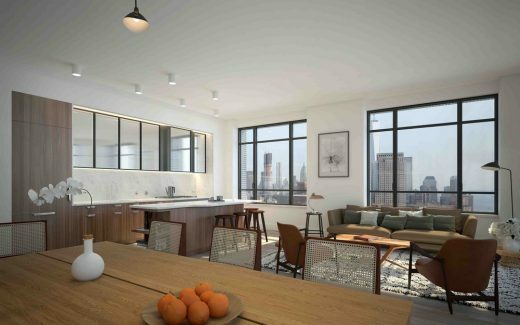 The overall design is a modern reinterpretation of the classic New York loft building typology, drawing inspiration from the neighborhood’s maritime and industrial past. The elegant interiors by the French architect Sébastien Segers take their cues from the golden age of Manhattan’s residential glamour. 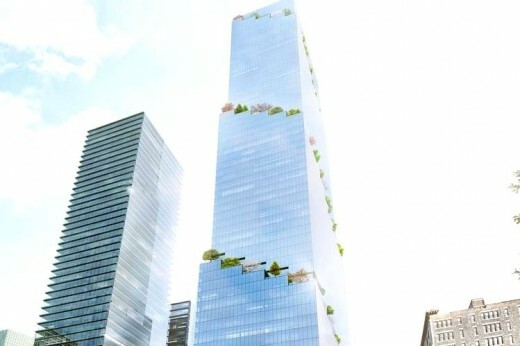 Greenwich West is a new 30-story tower located at 110 Charlton Street, at the crossroads of the iconic downtown New-York neighborhoods of Greenwich Village, SoHo and TriBeCa. 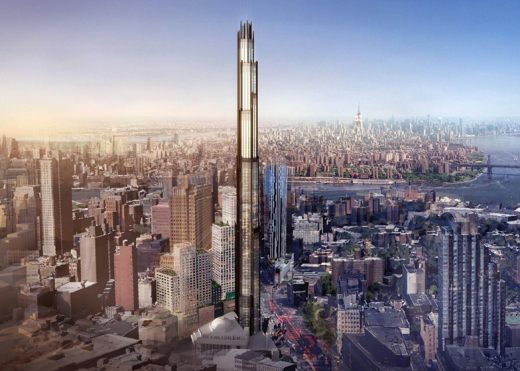 The 290-foot tower will be one of the more prominent buildings in the immediate neighborhood and provide unrivalled panoramic views of the Hudson River and NY harbor. The developer, Cape Advisors, teamed up with Strategic Capital and Forum Absolute Capital Partners to develop this 226,000 square foot residential project, which will be comprised of 170 loft-style apartments with amenities for residents including a residential lounge, entertainment suite, children’s playroom, fitness center and a roof top terrace. The project was conceived of by an innovative team of leading Parisian architects/designers: Loci Anima, responsible for the design of the building envelope; Sébastien Segers, for the projects interiors; and Patrick Blanc for the landscape design. This French team worked in close collaboration throughout the entirety of the projects development. The overall design is a modern reinterpretation of the classic New York loft building typology, drawing inspiration from the neighborhood’s maritime and industrial past. The elegant interiors by Sébastien Segers take their cues from the golden age of Manhattan’s residential glamour, with inspirations drawn as well from many important European sources. Sebastien Segers Architect is responsible for the total interior design concept of the Front of House areas including: the 170 residence units, the ground floor lobby, the residents lounge and courtyard, the basement fitness center and the roof top terrace. 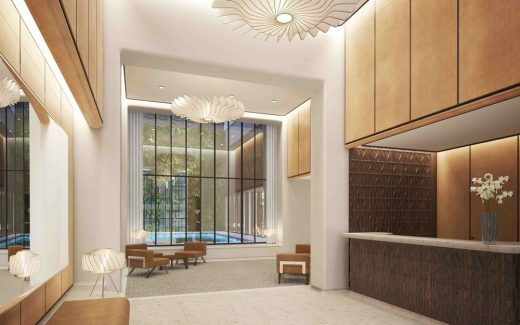 The design philosophy is to create for the residents an elegant and tailored environment with meticulous attention to finishes and detail, while creating a sense of calm and coziness. 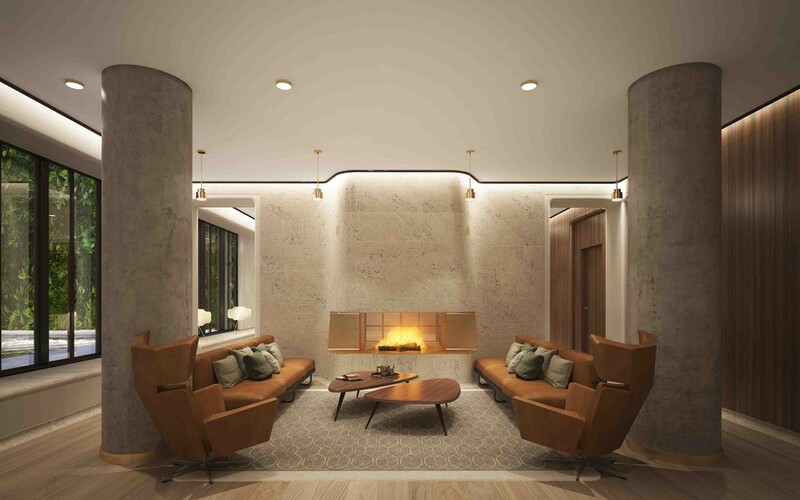 The simple elegance of the carefully honed interiors allow each individual to appropriate the spaces, so that each resident can feel comfortable and at home. 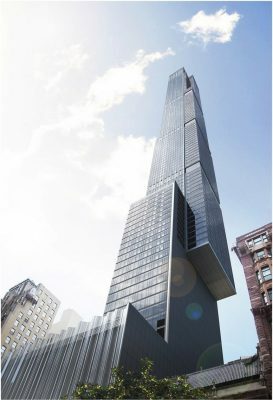 The project is intended to reflect the optimism and confidence that are endemic to the city of New York and its inhabitants, and while rich with historical references, the ambition here is to create a timeless contemporary and classic interior environment. 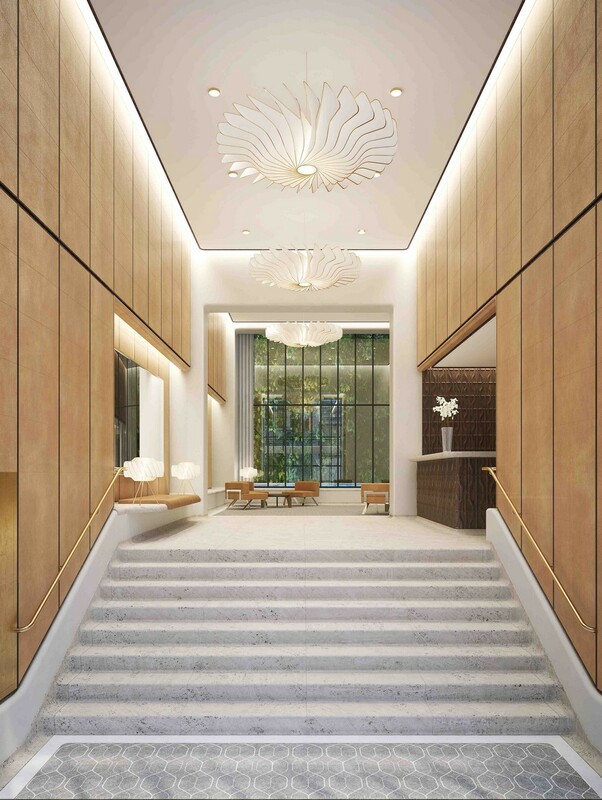 A grand stairway leads up to a generously proportioned lobby fitted in white travertine, rosewood millwork, with wall panels in natural leather. Double-height windows from the lobby frame a dramatic view of internationally acclaimed French botanist Patrick Blanc’s monumental vertical garden sculpture. Here curved corners and bold archways make clear references to the Art Deco style while the dramatic double height space draws its inspiration from the elegant lobby of the landmark Okura hotel in Tokyo. The residences of Greenwich West range from pied-à-terre studios to thoughtfully planned one, two, and three bedroom homes, many with terraces. The units range in size from 525 to 2100 square feet. In each residence, open plans are enhanced with classic European details; quality and permanence support the individual expressions of each private owner. 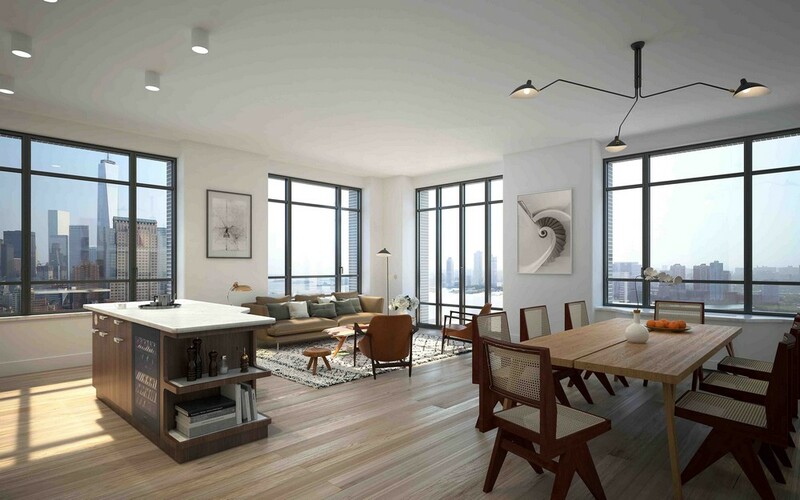 The building’s signature Atelier style windows overlook views of Manhattan and the Hudson River. 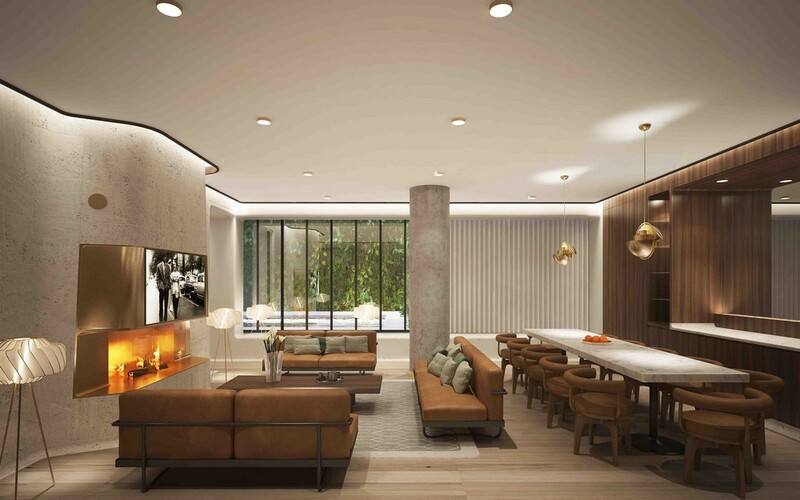 Every detail of Greenwich West’s interiors has been carefully conceived to create casually elegant spaces. Daylight streams in through large expanses of glazing across the wide-plank European white oak floors. The kitchens are constructed of American walnut and Carrara marble. Gently curved, hand-plastered interior wall corners echo the building’s stylized façade and impart a bespoke quality to each residence. Deep window sills are clad with honed finish Carrara marble and sculpted to evoke the quality of a Parisian fireplace. Engraved doors crafted with elegant custom detailing are punctuated by specially designed hardware to complete the modernist composition. European nickel-plated toggle light switches bring a high-end, Euro-chic detail to each residence. The kitchens have all been custom designed by Sébastien Segers. They are crafted in Europe by Molteni, combining walnut cabinetry, lacquered metal and fluted mirror. Custom kitchen islands are skillfully cut in Carrara marble with a “marine-edge”. 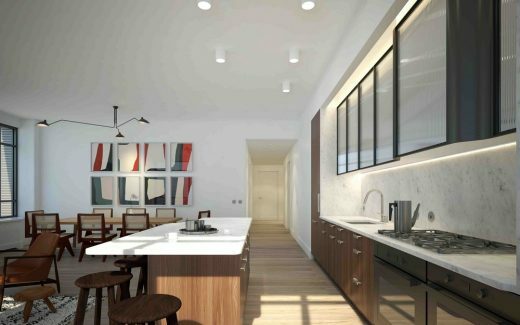 The marble countertops incorporate built-in bookshelves. The island features an ogee profile, also called “doucine” in French. This profile is the fundamental geometrical motif of the project that Segers uses in various applications throughout the project in the manner of a musical Theme and Variations: we see it repeated on the kitchen island marble top, window sill, doors details, bathroom vanity and wall molding. The luxurious master bathrooms are designed as sanctuaries clad in Carrara marble with rosewood vanities topped with marble counters. The polished nickel faucets are an exclusive line designed by the acclaimed French designers Ronan and Erwan Bouroullec for Hansgrohe Axor. The vanity top features another Theme and Variations: the Marine Edge, found on the kitchen island top and on the doors leaf. 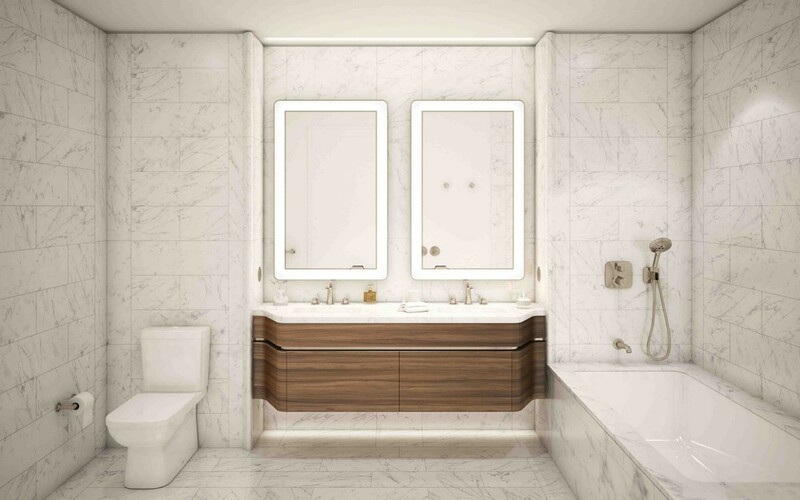 Elegant one-of-a-kind powder rooms with boldly striped Zebrino marble evoke New York glamour. The Greenwich West rooftop garden is a unique space for all residents. 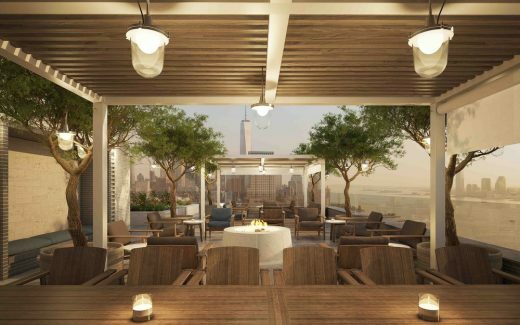 Various lounge and seating areas are choreographed into peaceful, landscaped vignettes, each offering breathtaking, unobstructed views of the city and river, and encouraging a sense of community among residents. A dining area and shaded alcoves anticipate convivial fairweather gatherings. 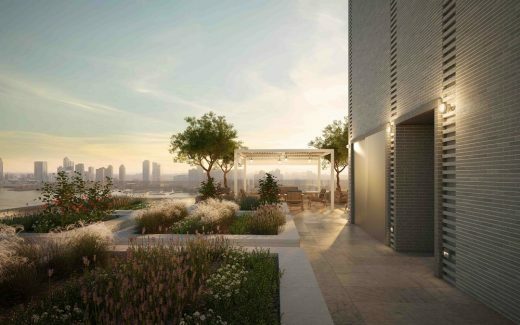 Greenwich West’s designer conceived of the residential amenity spaces as a sophisticated extension of home life. 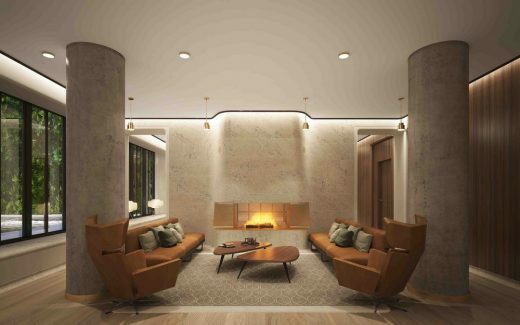 The Lounge with its intimate scale and sensual craftsmanship, with its central double-sided travertine fireplace, sculpted to echo again the ogee curved line. The atmosphere is hushed and cozy evoking a midcentury gentlemen’s club. A mirrored glass skylight graces the fitness center by The Wright Fit, which includes cast concrete walls, European oak and cork flooring. An elegant spa promises a place to rejuvenate with steam rooms, showers, and a dressing area enhanced with custom millwork. The landscaped vertical viewing garden is the work of the French landscape artist and botanist Patrick Blanc. Inside the silent courtyard, Blanc creates a work of art in which 147 different plant species flourish on planted walls that reach up to 18 feet in height as a rich visual backdrop for the lobby and lounge. 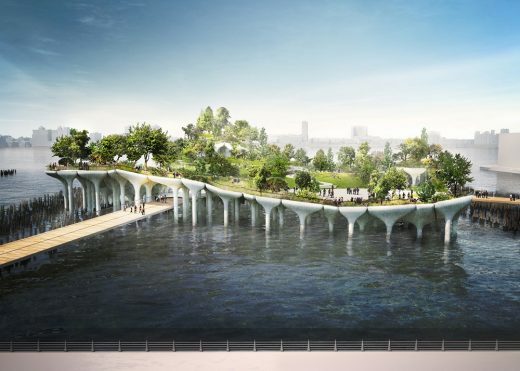 Greenwich West’s unique courtyard affirms the urbanite’s relationship to the healing power of nature. 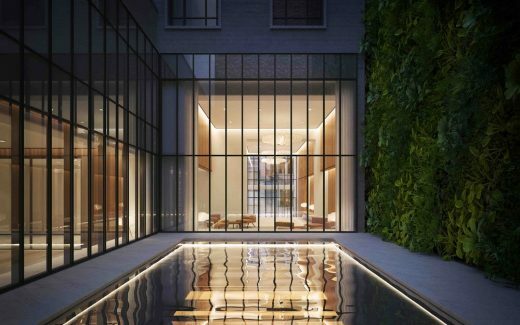 Segers designed the courtyard floor as an homage to the legendary NY architect Philip Johnson’s Rockefeller house garden, with a minimalist travertine stone design. Paris-based architect Sébastien Segers is highly regarded for combining rigorous design principles with a broad range of cultural references in his work. He began his career in 1996 as an assistant to the industrial designer Marc Newson while still a student at the Ecole Nationale Supérieure d’Architecture de Paris-Belleville, then went on to work with architect Jean Nouvel and later again with Newson as an architectural designer and consultant, before opening his eponymous studio in 2003. Today Segers enjoys collaborating on special projects with other accomplished designers such as Jasper Morrison and Daniel Buren in addition to his individual practice. Segers has individually completed architecture and interior projects for discerning residential clients and global luxury brands that include Giorgio Armani, Azzedine Alaïa and Parfums Christian Dior. 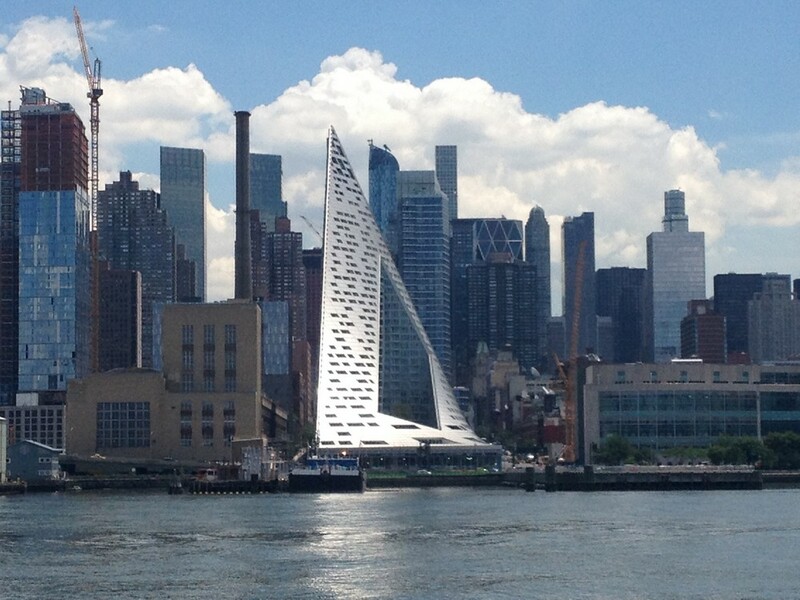 Sculptural geometry, intuitive use of space, and exquisitely refined craftsmanship characterize each of his projects. His architectural projects consistently reinterpret classics and express simple elegance and reconciled materiality, with the ambition to achieve serene and optimistic spaces. Through the reinterpretation of classical ideas in his projects, Segers attempts to achieve a sense of harmony through the use of formal and elegant design principals and refined materiality.